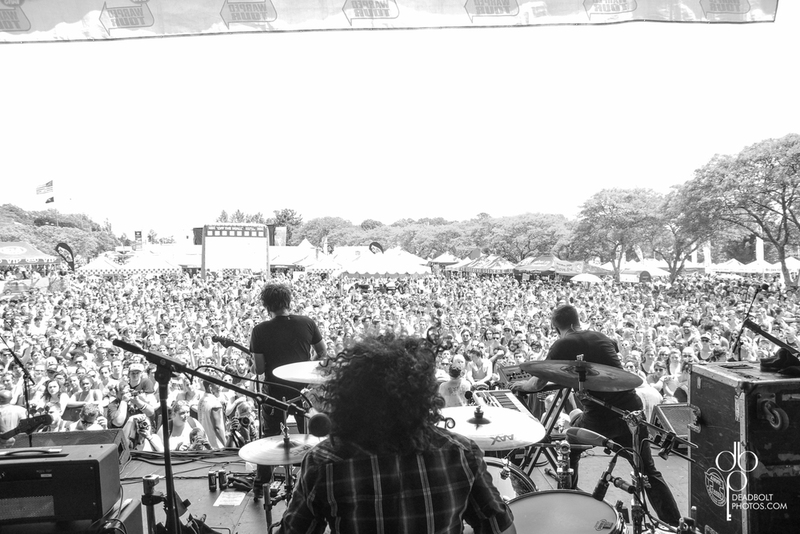 Motion City Soundtrack in front of a full crowd for Warped Tour 2013 and PNC Bank Arts Center. The annual Vans Warped Tour came through PNC Bank Arts Center on July 7, and for the second year in a row I was there to photograph it. I will be posting photos from the show going forward, but for the first set I chose Motion City Soundtrack. Motion City Soundtrack is a band I have seen play at least 15 times. A couple years back I spent a few days with singer Justin Pierre photographing another project he was a part of. This was my first time shooting the band and I was excited. The crowd was pumped too, it was easy to see. It was brutally hot all day, but MCS didn't let that stop them from playing an incredible set. And the thousands of kids didn't let that stop them from rocking out completely. I had stage access during their set and I did my best to make the most of it. It was pretty amazing to see all the kids lose their minds in front of the stage. MCS just announced an upcoming tour with Bayside for the fall, so even if you don't get a chance to catch them on Warped Tour you will have a chance to see them after. If it's been a while since you have seen them play, now is the perfect time. Note: I will be publishing photos from Warped Tour, but photos are also being published on pop-break, who I covered the show for. Go check out their site for more coverage.